"I would like to thank Ian and his team for a fantastic display at our recent Gifted and Talented Camp. The children (and the coaches) were enthralled by the performance which was delivered in a very professional manner. It was very inspiring and I hope that the children watching can appreciate what you can achieve when you work hard in your sport and put in the hours of practice." The Fun and Exciting Way to Promote Cycling and Healthy Living. • From just £395.00 all inclusive! For more information please view the video and FAQ’s below. Then email us for your password into our clients area where you can download an array of documents covering everything from terms & requirements to Health & Safety. 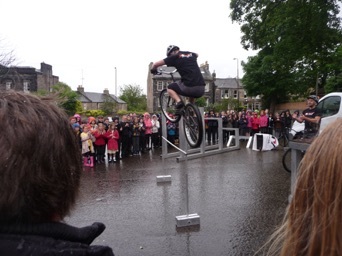 Can stunt displays really be an effective way to promote cycle safety?!?!? 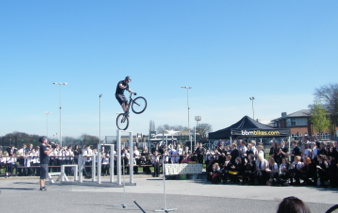 During a 3SIXTY display riders tackle obstacles with precise, calculated and effortless leaps. Riders never appear out of control and actually deliver the show commentary through helmet microphones whilst riding. These skills can only be achieved through hundreds of hours of dedicated and safe practice, a message we convey throughout each 3SIXTY display. 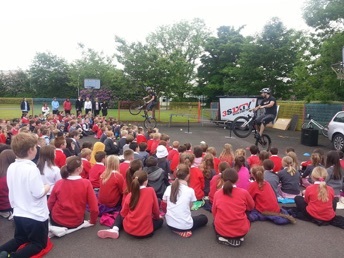 Our exciting displays capture a young mind and allow targeted messages to be conveyed effectively, 3SIXTY riders are role models making cycle safety and helmet wear ‘cool’. "I was totally impressed with the awe inspiring stunt show, your approach to the students and the enthusiastic manner in which you ran the training sessions. Our students and staff loved it. The skills displayed in the stunt show were incredible and the year group were quite literally spellbound by what they saw. Very impressive. Thank you!" Rates start at just £395.00 during the peak summer months from May to September, discounts are available at other times. You can view all our packages and rates on our client site, please contact us for your login details. An ideal space of around 15m x 15m. However we are flexible and are happy to adapt to the schools wishes. We perform in all weather conditions. Although we can also move our equipment indoors if preferred. Can you perform on any surface? Yes we can perform on pretty much any surface, please contact us if you have any major concerns. How many shows do you provide? Upto 6 depending on requirements and time used up with skills workshops. Can anyone take part in the interactive test track? Pretty much anyone can, however we do reserve the right to refuse entry to anyone we deem to be dangerous. Indeed we can, a school might typically ask us to deliver a desired message within our commentary or take part in media coverage, we are willing to go the extra mile and endeavor to participate in all requests. Upon booking you will receive a promo file with images and interview copy text ready for your promotional onslaught.